I remember when I first decided to don on my headscarf (hijab), I was 13 and starting secondary school. Back then the most fashionable clothes we (my sister and I) got to wear were something from our mom's wardrobe. It didn't help that my mom was not the fashionista that she is nowadays. We would turn up at school during extra-curricular activities on Saturday wearing brightly colored floral blouse (the one that only makcik2 wore), matched with equally bright floral hijab, black pants and (gasp!) white socks and flats! This fashion disaster experiment lasted till I was in second year in UTM. With the help of my roommate/bestie, Eva, and housemates who were all fashion forward, I started to dress my age and get to know what's hot and what's not. Back in my early twenties, being fashionable while wearing a hijab probably did not complement each other. Most ladies wearing hijab were either dressed in baju kurung, or wore baggy long-sleeved t-shirt (most of the time with their Uni logo and some famous caricature of a man with goatee printed on the shirt) and trousers. Since the past few years, this has changed as the fashion industry is booming with Islamic fashion and modern muslimah women are always thirsty to try out the new trends. Fashion designers are always working their best to provide to various fashion audiences with new creative ideas for muslimah women to enjoy. Every year new trends will come in to wow everyone and some may last for quite a while. However, if you are the type of individuals who love fashion but hardly have the time to research on new trends, here are some to give you some information about. 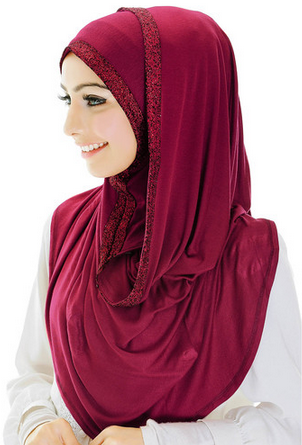 Among the trending forecast of muslimah clothing fashion for 2015 could be seen as below. Fashion designers have taken the traditional Malay/Indonesian kebaya and Japanese kimono to a new level by introducing a modern fusion of the kebaya kimono design. Kebaya kimono is a new fashion muslimah piece that definitely suits muslimah women of all ages. It could be serve as an outerwear for your top or act as a blouse. This kebaya kimono can be turned from formal to casual wear by simply mix matching with other pieces of clothing. When I looked back, I'm inclined to think that Muslimah clothing fashion started with the hijab. Tudung bawal used to be the most favourite hijab among Malaysian Muslimah. Then tudung awning made its appearance and this was followed by shawl hijab. Besides this list, I have my eyes (and heart) on another type of Muslimah fashion clothing namely abaya. It used to come only in solid black or dark green, abaya now can be found in all colours. It is simple to wear, modest, chic and easy to match with all types of hijab. Abaya is also a favorite because it suits all types of body shapes. Previous years, only the elderly and the conservative Muslimah wore abaya but today, abaya is worn by women of all ages including teenagers. If you are looking for more inspirations on Muslimah clothing fashion, a great site to check out is Zalora.com. With hundreds of fashionable items from both international and local brands, as well as great discounts, just be careful that you don't get addicted to their site.